Don't miss your last chance to catch Drum Corps International on the big screen in 2012! 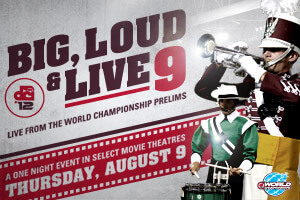 For its ninth year, Drum Corps International, Marching Music's Major League?„?, returns to movie theaters nationwide with the annual event DCI 2012: Big, Loud & Live 9 on Thursday, Aug. 9 at 6:30 p.m. ET/3:30 p.m. PT. Presented by National Cinemedia's Fathom Events and Drum Corps International, this year's live production will be shown in a record 609 theaters across 47 states, giving more drum corps fans than ever before the opportunity to experience this movie theater event. "The popularity of Fathom and DCI's annual 'Big, Loud & Live' events continues to grow," said Shelly Maxwell, executive vice president of NCM Fathom Events. "These stirring cinema competitions give everyone a front-row seat to watch the most elite marching music ensembles in the world." Broadcast live from Indianapolis' Lucas Oil Stadium, the World Championship Prelims will be beamed across the country through National Cinemedia's exclusive Digital Broadcast Network. Fiend a theater near you, and buy your tickets today!